Rubber Bulletin Boards and Tack Boards feature firm yet flexible posting surfaces with superior pin- and tack-holding power. In addition, they're easy to install on your wall, easy to clean, and many of our boards can virtually maintain themselves with their moisture, chemical, and bacteria-resistant surfaces. 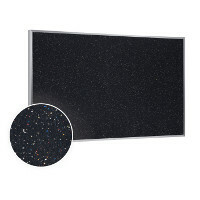 Buy a Rubber Tackboard today for a durable, low-maintenance alternative to traditional corkboards and bulletin boards.